Summer signing Matej Vydra will again feature for the Under 23s today as he gets closer to becoming involved with the first team. The £11m man has played in the first two games in the Professional Development League for Michael Duff’s side as he builds his match fitness up. And he was on the bench in Athens on Thursday night, only to be absent from the 18 at Fulham on Sunday. 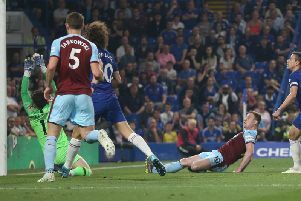 However, he will face Crystal Palace at the Barnfield Training Centre this afternoon, and Dyche feels he will then be up to speed: “Vyds will play again on Tuesday and then he’s more or less up and around the squad. “We got him involved in Greece, more to be around the group, because he’s only just got here. “And I said to him about Sunday, ‘not today, you’ll play again Tuesday, and hopefully be around it on Thursday’, and from then on we can look at him being considered part of the squad. Johann Berg Gudmundsson came off at Fulham with a hamstring problem, and he will be assessed. Dyche mused: “We are stretched at the moment, as everyone knows, particularly in the wide areas where we end up with a left back playing left side again. “But these are the complications of life at Burnley sometimes. “Unfortunately Robbie and Steven, we thought they’d be around for pre-season, and ready at this stage, and they’re not. “We tried to get players and couldn’t get them in. “So we are skinny on numbers, but that’s the reality, no excuses, just facts. “Robbie is back on the grass with us but still needs a games programme. I protect players to be right to play, not play them to get fit. So he still needs a games programme."